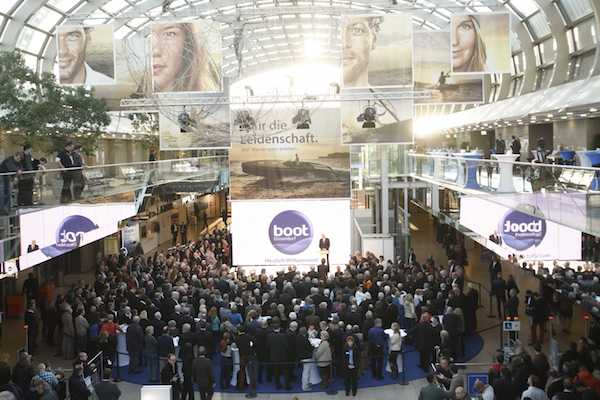 This year, Boot Düsseldorf created a lot of excitement and activity in the yachting industry. 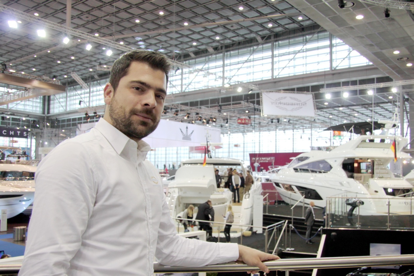 Sunseeker Hellas Sales Manager, Nikolas Makridis, shared some inside information following his recent visit to the boat show. From the 17th to 25th January, 17 halls of the Düsseldorf Exhibition Centre saw more than 1700 exhibitors from 57 countries presenting their brands in 213,000 square metres of exhibition. 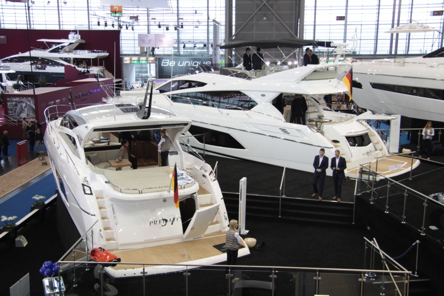 Some 1700 boats and yachts were moored in the harbour at the Düsseldorf Exhibition Centre. 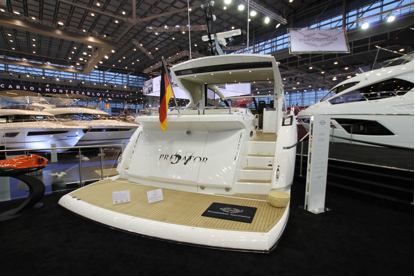 Visitor interest was quickly captured by the yachts on display at the Sunseeker stand, where the new ground breaking Predator 57 model was making her German debut, following an unveiling by Nicole Scherzinger at the London Boat Show earlier in the week. 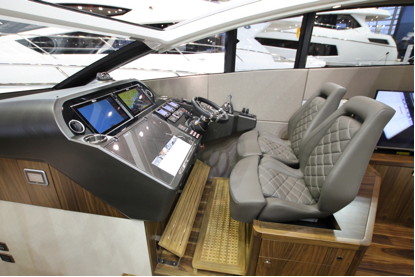 Designer and production teams had both an open and closed cockpit in mind with the creation of this new Predator, aiming to satisfy boat owners who prefer the space of an open cockpit area, but the comfort of a closed saloon. Thanks to the innovative electric patio door between the saloon area and the cockpit, this wish for many yachtsmen has now become reality. Unique to the Sunseeker Predator 57, this clever mechanism allows the patio doors to slide down into the hull for guests to enjoy uninterrupted views. At the same time it creates a seamless single area from the helm to bathing platform, together with a fully opening hardtop roof which comes as a standard. 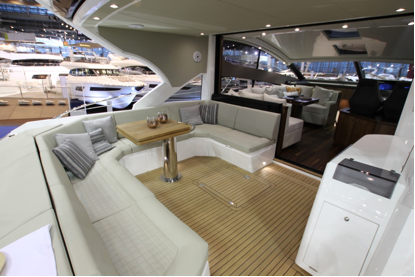 The result is outstanding – wide, open, light and airy spaces, mixed with exceptional Sunseeker pedigree performance. A large L-shaped seating arrangement, wet bar, cool plate and barbecue afford exterior luxuries for the owner and guests on board, whilst oversized new-style hull windows illuminate the interiors. Up to 6 guests in are accommodated in 3 beautifully appointed cabins which combine comfort, style and elegance. 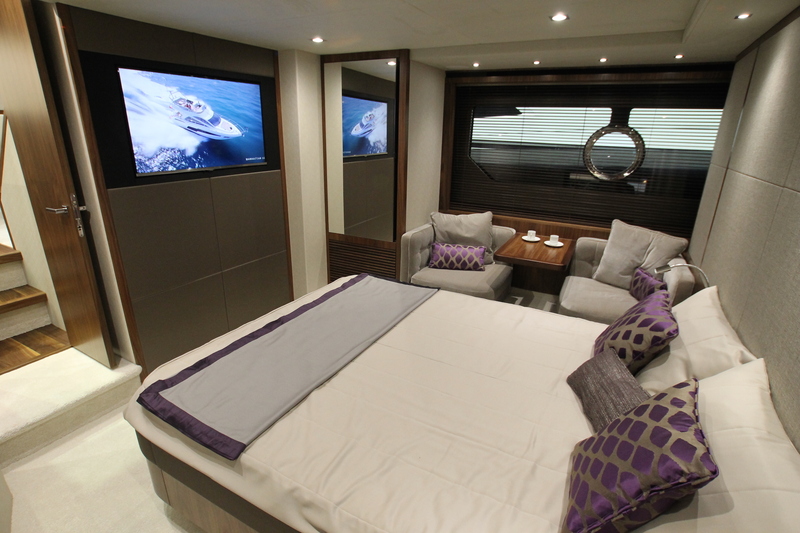 The full-beam Master Stateroom is a particular feature, which offers large opening portholes to allow the sunlight inside, a separate breakfast table area and a generously sized en suite bathroom. Cruising up to 40 knots (depending on the engine/drive option chosen) the Sunseeker Predator 57 will create an seriously impressive figure as she pierces through the water. Combining sleek design, technical innovation, spacious areas and fine materials – the Predator 57 is a remarkable sports yacht that really must be seen. 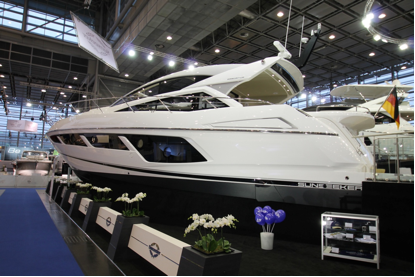 It’s no wonder that Sunseeker Hellas have seen exceptional interest in this model at the London and Dusseldorf boat shows already. 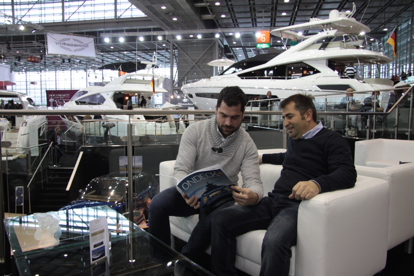 Sunseeker Hellas would like to thank their good associate Mr Gerasimos Gerolimatos, Chief Editor of Skipper OnDeck magazine for all his support during Boot Dusseldörf 2015. Here’s to an exceptional 2015 boating season!